RINO Sen. Lindsey Graham (R-SC), and his bud John McCain, are known neo-cons, aka warmongers for Israel. Two days ago, on April 16, 2018, Graham criticized the Trump Administration’s April 14 firing of 105 missiles at Syrian government targets over an alleged, wholly unverified chemical attack in Douma, a suburb of Damascas (more on this latest Syrian crisis later, in a post to come). Graham criticized President Trump for not doing enough, calling the bombing a “major step backwards” because the missile-strikes had failed to weaken Syrian President Bashar al-Assad and his government. A lifelong bachelor, RINO Sen. Lindsey Graham (R-SC) is long rumored to be homosexual. Now Wayne Madsen, who calls himself America’s foremost “independent” journalist, publicly declares Israel has the goods on Graham and is using his closeted homosexuality to blackmail him. “Graham is a well-known neoconservative war hawk. He was hoping obviously that John Bolton, who’s his fellow traveler in neoconservative circles and the new national security adviser, that we would see a more sustained military attack against Syria. What Lindsey Graham wanted to see of course was a US attack on Syrian airfields, infrastructure, the presidential palace, and on the nationals of Russia or Iran or Lebanon, and members of Hezbollah killed. That’s just fine for Lindsey Graham. 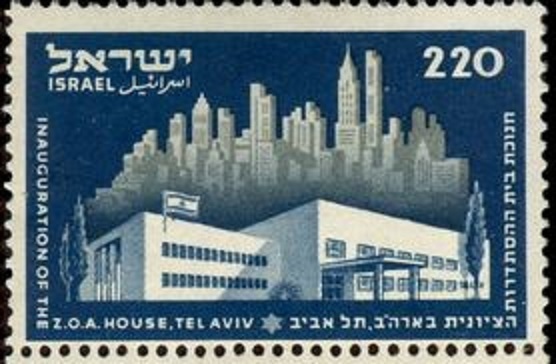 The identification of Israel’s interests as America’s interests is best illustrated by an Israeli stamp (below) that was issued upon the inauguration of the Zionist Organization of America House in Tel Aviv. Founded in 1897, the Zionist Organization of America (ZOA) is the first official Zionist organization in the United States, and the primary representative of American Jews to the World Zionist Organization. ZOA was instrumental in mobilizing the support of the U.S. government, Congress, and the American public for the creation of Israel in 1948. Following the founding of Israel, and to unify Jewish representation with the executive branch of US government, the ZOA became a charter member of the Conference of Presidents of Major American Jewish Organizations. Today, ZOA claims to have 25,000 members. This entry was posted in Congress, Israel, LGBT, United States and tagged ALIPAC, Sen. Lindsey Graham, William Gheen, Zionist Organization of America, Zionist Organization of America inaugural stamp. Bookmark the permalink. Yes, Mr. Gheen, you speak of me, I’m one of those folks who this news catches him flat-footed while drinking my Monday-Morning coffee. Damn!